1. Combine the eggs, mayo, dijon mustard and diced celery. Mix and season with salt and pepper. Taste and adjust ingredients if needed. 1. Combine the tuna, dijon mustard and diced celery. Mix and season with salt and pepper. Taste and adjust ingredients if needed. 1. Combine the cream cheese and sriracha in a small bowl and blend together until the sriracha has been fully incorporated. 1. 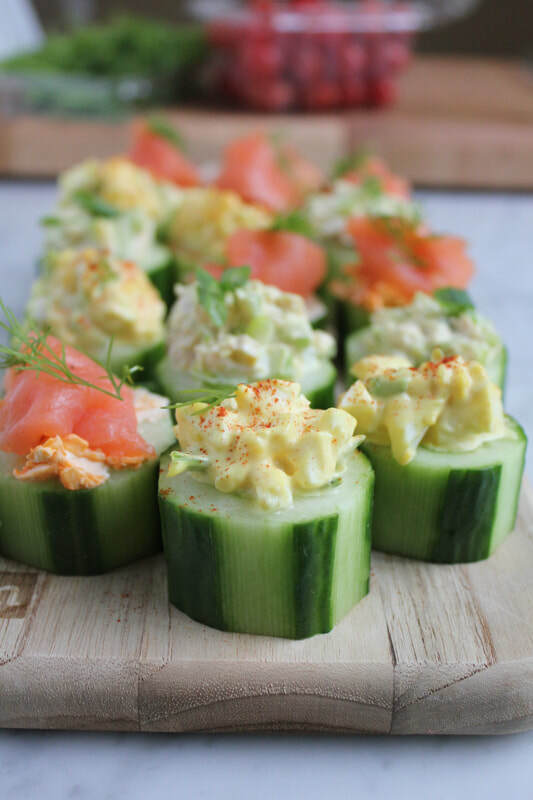 Core out a little of each cucumber piece and fill with the egg salad, tuna salad and cream cheese mixture, separately. Top the egg salad with the smoked parika. Top the tuna salad with the green onions and place the smoked salmon over the cream cheese and top with some fresh dill.